Before the troubles in Dubai, you could reasonably have thought that the financial part of the financial crisis was over. Governments around the world took extraordinary steps late last year and early this year to stop a panic, and they largely succeeded. But pumping trillions of dollars into the global financial system did create at least one unavoidable side effect: Many of the excesses of the boom years were never quite worked off. So we should probably expect some more mini-busts —some more Dubais, if you will—in the near future. As it happens, I was in Dubai just two weeks ago, and I arrived expecting to find a boomtown that had been somewhat humbled. A sort of cross between Las Vegas and Singapore, the city-state had become one of the most obvious symbols of global excess in recent years. Its architectural style may best be described as Modern Hubris: A ski resort was opened inside a shopping mall, and a network of islands were built to resemble a map of the world. When the crisis hit, not surprisingly, cranes were suddenly idled, and hundreds of thousands of migrant workers were forced to leave. And yet Dubai still feels more like a boomtown than anything else. While taking a walk on a Persian Gulf beach at 6.45 one morning, I could hear clanging coming from one of the nearby skyscrapers still under construction. The migrant workers I met talked about being able to make four times as much as they could in India or Pakistan. A sparkling new subway system just started running, and the world’s tallest building was nearing completion. But some of this, we now know, was a result of Dubai’s continuing to live beyond its means. Last week, Dubai World—a government-owned developer and investment company that built those islands in the shape of the world map—announced that it would not be able to repay all its debts. The company has instead asked lenders to accept less money than they are owed. The triggering event seemed to be a $3.5 billion (Rs16,205 crore) payment due on 14 December, the first of about $25 billion in loans that come due over the next three years. “Dubai World was facing a cash crunch," says Kenneth Rogoff, a former chief economist at the International Monetary Fund, “and they couldn’t find someone to help." Dubai had been relying on neighbouring Abu Dhabi, which is also part of the United Arab Emirates and has vastly more oil, for bailouts over the last year. Once Abu Dhabi made clear that its patience was wearing thin, Dubai had to go to its creditors last Wednesday and tell them they wouldn’t be getting all of their money back. Around the world, financial markets quivered. Market watchers wondered whether investors would flee from anything that looked risky, much as they had after Lehman Brothers collapsed. Obama administration officials spent the Thanksgiving weekend monitoring overseas markets. Economists speculated about which debt-laden country or company might be next. A week later, I think we can draw two tentative lessons. First, the financial system is indeed in much better shape than it was early this year. At least so far, almost none of the wider fears have come to fruition. Stocks around the world have recovered most of their losses since late last week. A more specific measure of investor fears—the TED spread, the difference between the interest rates on interbank loans and on conservative short-term debt issued by the US treasury—looks as if nothing special happened. After rising a bit on Friday, the TED spread closed on Tuesday at roughly its lowest level in more than a month, 0.21%. In October 2008, by contrast, it peaked above 4.5%. The second lesson is that as governments withdraw some of the guarantees they have given financial markets, more flare-ups are bound to happen. Guaranteeing Dubai World’s debt was effectively what Abu Dhabi had been doing. Once it stepped back, there were not enough private investors to fill the void. They were frightened off by Dubai World’s prospects. One of its principal assets, notes Francesco Garzarelli of Goldman Sachs, is “real estate in a place where there has been overconstruction". Where might the next flare-up come? 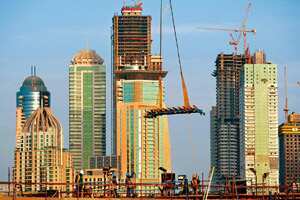 A big commercial real estate developer could follow the path of Dubai World and find itself unable to repay debts. Or the housing market could be about to weaken again, as two reports suggested last week. Or stock market investors could decide that the recent rebound—with the Standard & Poor’s 500-stock index up 64% since its March low—has been excessive. Fortunately, the last week has suggested that the world economy might now be able to handle any one of these problems. Dubai was a stress test, and the financial system passed. Which is all the more reason that policymakers around the world should continue to shift their focus now. The financial crisis itself was yesterday’s main problem. The fallout from the crisis—starting with unemployment—is today’s.